Emily (Miner) White was born on Aug. 8, 1888 at Hundred, Wetzel County, WV, the daughter of Andrew Jackson and Mary Louise (Johnston) Miner. Her husband was an early Methodist-Episcopal Church minister in our family. In 1898, when Emma was 10, she and her parents moved back across the state line into Pennsylvania, making their home as tenants in Chartiers Township, Washington County, and lived on the farm of Alexander Gaston. 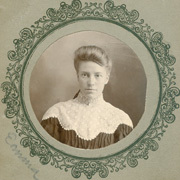 The Miners moved again in about 1901 to a rented house on Broad Street in the west end of Washington, the county seat of Washington County, PA.
Emma is seen here as a young teenager, with long hair wrapped around her shoulder, and holding a bunch of flowers, with a fancy hat at her feet. She is believed to have been close with her first cousin Minnie (Miner) Gary, who was just four years younger and lived in the old family farming region of Kingwood, Somerset County, PA.
Emma and Lester had two sons, Kenneth Allen White and Dr. Thurman C. White. The Whites made their home during their early years of marriage in Washington. Their eldest son Kenneth lived there. In 1914, they moved to Upland, Grant County, IN, where Lester began to pursue his dream of Christian ministry by enrolling in seminary classes at Taylor University Academy. After obtaining an academy degree in 1918, he began studying for a bachelor of arts degree in the ministry. He served as the "campus storekeeper" and was a member of the Thalonian Society, an important literary group. Taylor yearbooks for the era show that Emma played an important role in promoting Lester's studies. One yearbook listed him with the quote, "Give me, next good, an understanding wife." Another yearbook listed him with the comment, "It is not good for man to be alone." During that time, their son Thurman was born. Stylish Emma poses in a series of arcade photographs with her nieces Grace Miner (who later became her sister in law) and Ollie Miner (bow in hair). The federal census enumeration of January 1920 shows the Whites living in Upland, with the 31-year-old Lester marked as a "student." Later that year, after her father suffered a stroke of paralysis, and was unable to care for himself, he and Emma's mother traveled from Washington to live under the Whites' roof. It's said that she forbade her father from using chewing tobacco, even though he complained, "But it pleases my mouth so." Emma's father died in their home in early January 2921, and the mother lived only until the end of that year, succumbing on Christmas Eve 1921. their remains were shipped back to Washington for interment. 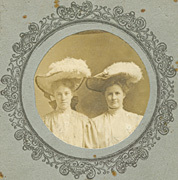 Graduating in 1922, Lester and Emma made the decision to return to Western Pennsylvania. 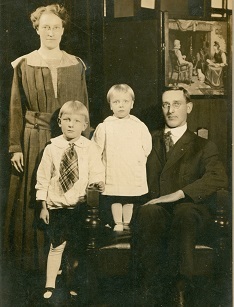 The family maintained ties to Taylor, as a nephew of Emma's, Richard A. Plants, later studied there and today is enshrined in the university's sports hall of fame for a standout track career. Emma immersed herself in her home community. She was a member of the West Washington Methodist-Episcopal Church (seen here) and sang in the choir for more than 50 years. She also was an active member of the Women's Christian Temperance Union (WCTU). Emma's brothers Ward and Harry were active in the West Washington congregation, and Harry's widow Armena and their daughter Grace were Sunday School participants for more than half a century. Lester entered the Pittsburgh Conference of the Methodist Episcopal Church on trial, later receiving full ordination. During the next six years, he served three churches -- Luxor, east of Greensburg, PA; Robinson Street Mission on Pittsburgh's North Side, and Freedom, Beaver County. While at Luxor, he added four Sunday School rooms to the church. While at Freedom in January 1928, heartache rocked the family when Lester became gravely ill. He "gave up his work to others, although he retained the direction of the church activities until conference met in October, when he took a retired relation until he should regain his health," said the Washington Observer. On April 29, 1929, unable to beat the cancer that had ravaged his body, Lester died at the home of his parents in Washington. He was laid to rest at Washington Cemetery. His passing left Emma as a widow at age 41 with adolescent sons aged 15 and 12. Emma outlived her husband by nearly four decades. She made her home alone as a widow on Church Street in 1930. Son Kenneth helped support her and the family by working as a sales clerk in a department store. Later, she moved to a residence at 588 Fayette Street in Washington. When her aunt Rosetta (Harbaugh) Miner died in Somerset County in 1953, Emma went out of her way to take a bus to attend the funeral. Emma died on April 17, 1966, at the age of 78, at Shawley's Nursing Home, Youngstown, Mahoning County, OH. She was buried beside her husband, after a separation of nearly 37 years. Lester's career is summarized in Smeltzer's 1968 book, Methodism in Western Pennsylvania 1784-1968. Emma also is mentioned in the volume, still found in used bookstores today. Years later, in about 1981, cousins of the Farabee branch visited Emma's cousin Minnie Gary at her home in Kingwood, Somerset County. Afterward, Minnie sent them a card, and, not knowing whether Emma was dead or alive, Minnie asked, "Did you hear [any word] from Emma or Lucy Martin?" Son Kenneth Allen White (1913-2006) was born on Oct. 28, 1913 in Washington. As a young boy he moved with his parents to Upland, IN, where he grew up. In about 1922, his father having graduated, they returned to Washington. He married Edith Aileen Supler (1912-2005) in August 1935. At the time, he was age 21, employed as a clerk, and lived at 141 Church Street in Washington. She was age 22, the daughter of Lester and Sarah Naomi (Morris) Supler, and resided at 71 Fulton Street in Washington. Their three daughters were Joy Elaine White, Meredith Ann Tarbell and Faith Irene Berg. The Whites moved to Rutland, Rutland County, Vermont. There, they owned and operated the Green-Mont Motel at 138 North Main Street in the heart of the Green Mountains. Promotional postcards for the motel show that it featured "30 modern rooms - private bath with shower or combination tub and shower. Connecting units. TV - telephones and radios available. Automatic heat - room controlled. Open all year. Fine restaurants nearby"
Edith suffered from congestive heart failure. She died in Wake Robin assisted living facility in Shelburne, VT on June 16, 2005, at the age of 92. Kenneth endured metastic colon cancer, and spent his final years in the Wake Robin facility in Shelburne. He died at the age of 93 on Dec. 22, 2006. Burial was in Evergreen Cemetery in Rutland. Granddaughter Meredith Ann White wed William Allen Tarbell in 1958. Granddaughter Faith Irene White married Allen Norman Berg in 1969. They resided in Rutland. Son Thurman C. White (1917-1990) was born on Jan. 26, 1917 in Upland, IN, where he father was studying for the ministry at Taylor University. As a boy, he returned to Western Pennsylvania with his parents and brother. At the age of 23, while a student, he lived at 734 Brunot Street in Verona, near Pittsburgh. On Aug. 31, 1940, he married 19-year-old Hazel Elizabeth "Betty" Best (1920- ? ) , a stenographer living in the Pittsburgh suburb of Oakmont. She was the daughter of Elmer C. and Hazel I. (Coulter) Best. They had two sons, David Lester White and Keith Allen White. He became a chiropractor and practiced for many years in Blairsville, Indiana County, PA. In 1955, he received a certificate of merit from the Pennsylvania Chiropractor Society. The Whites eventually divorced. Later, Thurman relocated to Spartanburg, Spartanburg County, SC where he is said to have owned an antiques business. Thurman died on Feb. 15, 1990, at the age of 73.